It was a landslide victory for the incumbent Board of Directors who ran for re-election against new contenders Jake Jordana, Fiscal Jorge De Joya, Jorge Santiago, Sanjay Thakur and Atty. Roland Beltran. The legal issues plaguing the club were central to the discussion at the AGM and were a pressing concern for many, with one group questioning the position of the Board on the expenses being shouldered by the club for its legal defense. Long-time Director Matthew Freeston garnered the highest number of votes with 126, while Rolando Goitia received 125, Vic Akillian 124, Jena Fetalino 122 and Shiela Ubana 121. Former Nomads Comelec head Jorge Santiago topped the opposition with 29 votes. Sanjay Thakur had 27, Rolando Beltran and Jake Jordana got 26 votes each, whereas Jorge De Joya conceded even before the ballot counting was finished. Forty-seven (47) members voted in person, and One Hundred One (101) submitted valid proxies, for a total of ONE HUNDRED FORTY EIGHT (148) valid votes cast in this year’s election. Twenty One (21) proxy votes were invalidated for reasons ranging from non-payment of dues to account in arrears, signature discrepancy, and personal voting by the proxy givers. 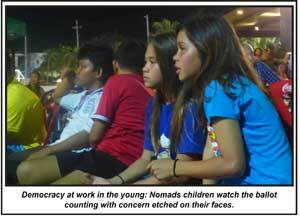 No protests were lodged with the Nomads COMELEC, prompting the proclamation of winners on December 20, 2012. It was an election of many “firsts” – for one, policemen from Barangay Merville were deployed in the vicinity. Their presence was requested by Comelec Head Atty. 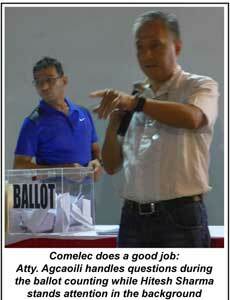 Peewee Agcaoili to ensure a safe and a peaceful election process. Poll Watchers also played a role for the first time, with Faisal Khan being appointed for the 2012 BoD and Atty. Cindy Villareal, Atty. Joana Marie Paguio, Hope De Joya and Vinay Panemanglor for the other group. The ballot counting went on for over three hours, the longest vote count ever recorded, which many members, including their children, witnessed until the last ballot was accounted for. Atty. Luis “Peewee” Agcaoili, a longtime member of Nomads, together with Tonichi Severino and Hitesh Sharma comprised this year’s Comelec that handled what was initially perceived as the most challenging BOD election in the club’s 99-year history. New guidelines and procedures were formulated by the committee on the conduct of the election including the appointment of poll watchers, clarifications done on the proxy votes and ballot counting. But while the recent election was the longest due to the counting of ballots, it was by far the most organized, credible and transparent. 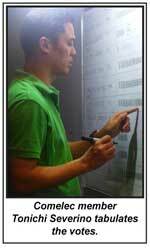 The ballots were counted before the members and each were inspected by the respective poll watchers. The election was described by many as a “healthy democratic exercise” with several members actively participating and having their voices heard on how the club should proceed as it nears its centenary.